Started making wheels April 2018! Please contact to renew order requests! 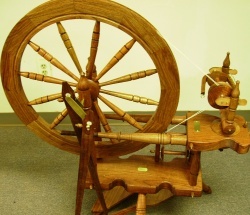 What is a custom built spinning wheel? The majority of spinning wheels made today are made on automatic machines, and for the most part they work fairly well. Custom wheels are handmade, and are usually one of a kind. Wyatt wheels are truly custom spinning wheels. Each part is hand made and I only build one wheel at a time. After a wheel is finished, I spin on it until it meets my exacting standards. When I first started to spin, I knew very little about spinning wheels. I bought a commercially available wheel kit, and put it all together and more or less taught myself to spin. I have somewhat of a mechanical mind and thought I could build a better wheel. It took me about three months, and a lot of research to come up with a working wheel. Since that first one, I have made quite a few improvements and think I have come up with a spinning wheel that is as near perfect as one can make. I only make wheels on order and let the customer choose options such as; ratios, type of wood, left or right handed, orifice height, etc. All wheels are serial numbered, dated, and signed. They also come with a certificate of authenticity. . Also, a brass plaque with the name of the person the wheel was made for and the year it was made.